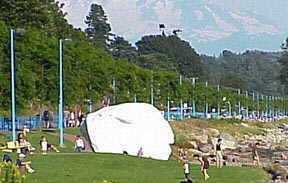 It is the great white rock which gives the City of White Rock its name. 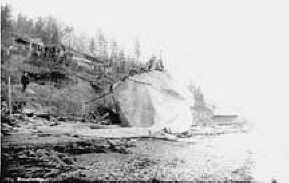 Legend tells us that, long before the arrival of the discoverers Cook and Vancouver, the Gulf of Georgia was ruled by a Sea God worshipped by the Cowichan Indians. The Sea God had a son, tall, handsome and strong, who dwelt with his father in a subterranean cavern not far from the present town of Sidney on Vancouver Island. On the shores of the gulf, on the original site of Sidney, lived a tribe of Cowichans, whose Chief had a beautiful daughter whom many young braves had wooed, but she refused them all. One day when the lovely Princess was bathing in the waters of the Gulf, the son of the Sea God rose to the surface beside her and, as mortal youths had done, fell in love with her at first sight. He seized her and carried her off to his father's mansion, in front of which was a tremendous totem pole of rock carved with the history of the ocean. The Sea God was angry with his son for bringing a mortal, even one so fair, to his Kingdom, and, refused his blessing on their marriage, ordered them to return to the girl's tribe. The young God, determined to keep his Princess, went with her to her father's home where she said he would be as welcome as a son, and in time would rule. But when they rose from the water and presented themselves before the old Chief of the Cowichans, he too refused to accept the, and declared, like the Sea God, that mortals and Gods should not wed. The young man, by now more determined than ever raised in his powerful arms a huge white rock which stood on the shore and said to the Princess: "I will hurl this tone over the water! Wherever it falls, there we will make our home and establish our tribe." So saying, he cast the stone far over the gulf. High over the island it went, and as it rose the son of the Sea God took his bride in his arms, dived into the sea and swam off in the direction of the great boulder. 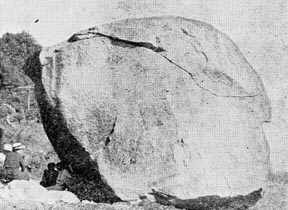 So swift were his movements that, as the huge rock fell on the mainland shore sixty miles away, the young God and his bride rose out of the water be side it. There on the shores of a bay shaped like the crescent moon, they made their home, and the mighty Semiahmoo Tribe, the half moon tribe, grew and became famous. After many years the tribe dissolved, but a remnant of that once great and powerful people still lives near the Rock. 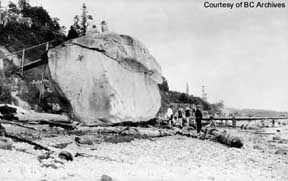 The White Rock in the early days when homes were built on the beach and viewing from the top of the rock was encouraged. 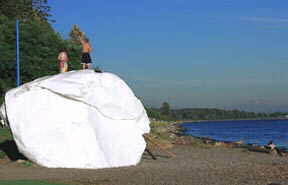 More recent photos of the White Rock with a manicured setting and the prominade behind it.